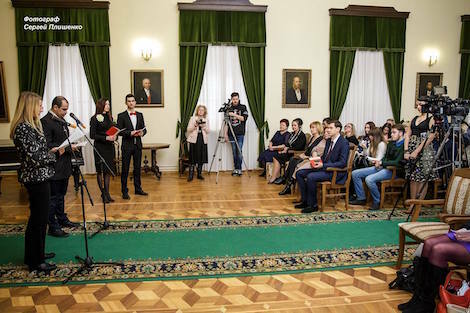 March 5, 2018: Dr. Britte Kaiser-Schuster, director of German-Russian Museum Dialogue (DRMD) in Berlin and Dr. Annette Hüsch, director of Kunsthalle zu Kiel (Kiel Museum of Art) visited the city of Taganrog to inaugurate the special one-painting room, presenting the "The White Willows at Pond" by Vasily Polenov and its history. Among the guests of the event held at the historical building of Taganrog Chekhov Gymnasium were also Mr. Vladimir Babin — Rostov Oblast minister of culture, Mrs. Inna Titarenko — Taganrog City Executive, Mr. Vitaly Bogdanov — Deputy director of Russian Foreign Affairs Ministry's Rostov office Rostov Oblast Regional Council deputies, art experts from Moscow, Saint Petersburg and Rostov on Don, representatives of the local business community and Taganrog Local Government. Frau Dr. Kaiser-Schuster speaks at the official ceremony. © Sergey Plishenko. The history of the painting's return has been quite interesting. "The White Willows at Pond" was made by Vasily Polenov in 1881 and came into a private collection in Taganrog many years before the Russian revolution. In 1920s it became part of the museum's exhibition and on August 27, 1943 it was displaced in an unknown direction. It first surfaced in 1959, when it was put up for sale at a Munich art gallery. In 1975 it was acquired by Georg Schäfer and decorated the interiors at castle Alt Schloss Obbach in Euerbach, Germany. On March 12, 1986 the amount of 40000 German marks was paid by Schleswig-Holstein's regional government to make it a property of Kunsthalle zu Kiel. "The White Willows at Pond" by Vasily Polenov. © Sergey Plishenko. Since 2015 the Kunsthall zu Kiel has led the research work in cooperation with German center for lost cultural objects to identify the artworks seized by the state during the Nazi regime. The research work led on the Russian side by the Taganrog Group of Museum staff in 2005—2006, which resulted in the publication of "The Joint Catalog of Taganrog's Cultural Objects looted or lost during World War II". 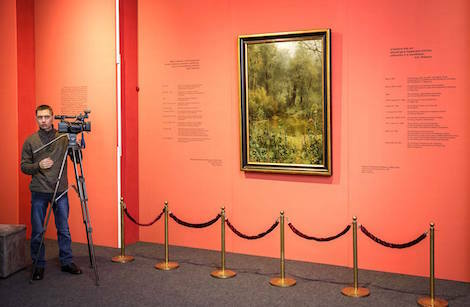 After several examinations of historical documents made by museum workers and German-Russian Museum Dialogue (DRMD), suspicion on the origin of Polenov's artwork was raised. All doubts were removed after additional information, rare materials and a unique black and white photograph were provided by Taganrog Group of Museums. The analysis proved that the artwork in Kiel is the Polenov painting displaced by German Wehrmacht in 1943. Frau Dr. Hüsch speaks at the official ceremony. © Sergey Plishenko. On September 26, 2017 an official handover ceremony was held in the city of Kiel. Among its participants on the Russian side were Mrs. Lipovenko - director of Taganrog Group of Museums, Mrs. Balina - Rostov Oblast minister of education, Mr. Ksenofontov - director of the Cultural Affairs Office at the Russian Embassy in Berlin. "The moment of Vasily Polenov painting's return to Taganrog is not merely a legal act. This is also a sign of our own history's "recovery", a sign of peace and good relationships between our two countries", told Dr. Hüsch at the ceremony —"It was both a happy and sad moment to say goodbye to the painting. "The White Willows at Pond" will always remain in the cultural memory of people of Kiel". City executive Inna Titarenko presents commemorative gifts to the German guests. © Sergey Plishenko. "The history of this artwork and of its homecoming — is a history of relationships between our countries, and I am very glad that it finished well" — highlighted Dr. Kaiser-Schuster of German-Russian Museum Dialogue (DRMD). 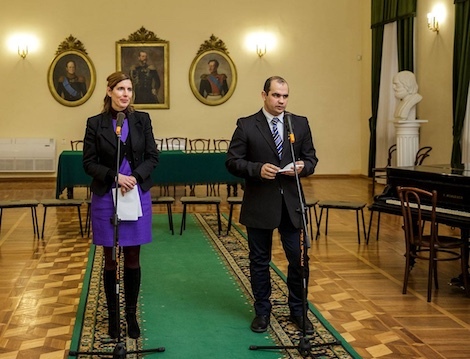 Taganrog City Executive Inna Titarenko thanked the German guests for the conducted work and return of the painting to Taganrog, and expressed hope that it would be the beginning of friendship and cooperation between the cities of Kiel and Taganrog.